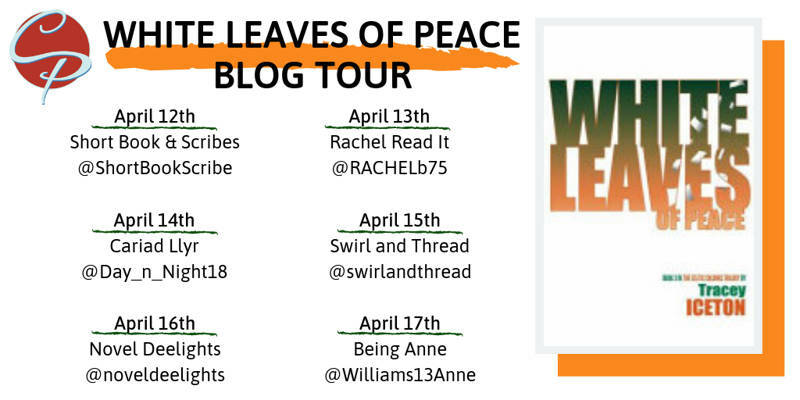 I’m so pleased to be opening the blog tour for White Leaves of Peace by Tracey Iceton today. 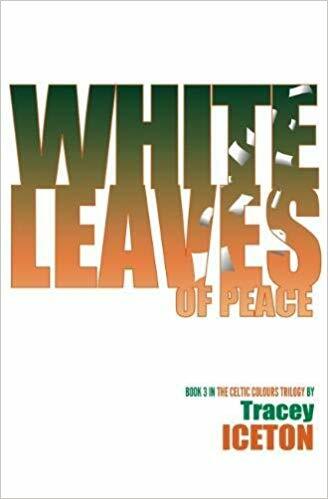 Tracey has very kindly written a guest post about White Leaves of Peace and the Brexit vote for me to share with you today. My thanks to Karen Bultiauw for asking me to be a part of the tour. The final part of the explosive Celtic Colours Trilogy. When the big men get around the table on Good Friday of 1998 and sign up to peace in Northern Ireland nine year old Cian Duffy’s story should have ended. Instead it is the beginning of a decade of Troubles for him. Haunted by his mother’s IRA past and chased by present day violence sectarianism, Cian ends up being forced to flee peace-torn Belfast. Facing a life in exile, he reconciles himself the past and makes a new life for himself, somewhere he feels he belongs. Then Britain votes for Brexit; the old adage of England’s difficulty being Ireland’s opportunity is tabled yet again and Cian has to confront the past and the future. White Leaves of Peace is a stark reminder that ending a war takes more than the signing of a treaty. Peace is hard won. You have to fight for it. Having focused parts one and two, Green Dawn at St Enda’s and Herself Alone in Orange Rain, of my Celtic Colours trilogy around historical events that had already been written I knew part three, set to conclude my story of a century of conflict in Ireland by bringing the narrative up to 2016, would be a different challenge. Green Dawn, centred as it is around the 1916 Dublin Easter Rising, had a clear focus, a point that the story was always heading towards as the main character, Finn Devoy, takes his place alongside his headmaster and commanding officer Patrick Pearse. Although Orange Rain doesn’t build to a single climactic event in the same way, in common with part one, its setting of the 1980s is a time of armed campaigning by Irish Republicans. So Caoilainn Devoy’s story involves her in real life events including the infamous Brighton bombing and Gibraltar shootings. Set post the 1998 Good Friday Agreement, in a time of declared, if not actual, peace, I was worried that with White Leaves I would struggle to construct a reality-based story sufficiently dramatic for a novel, culminating in a genuine climax. Then along came Brexit. I suddenly had something with more drama than I could have imagined to point my main character, Cian Duffy, towards. I should, now, acknowledge the lady who spoke up at the end of a talk I was giving to the U3A in Stokesley in January 2017. The talk was entitled ‘England’s Difficulty is Ireland’s Opportunity’ and explored this Irish adage in relation to how the Easter Rising took advantage of the First World War. During the Q&A this lady, whose name I sadly didn’t get, commented, “Well, if that’s the case, surely this [Brexit] is the best opportunity the Irish have ever had!” And, although Brexit had been circling among the ideas for White Leaves (I was still planning and researching at that point) I then knew what it meant for the novel: a chance to speculate on the response of Irish Republicans to the UK’s exit from the EU. I’m sure readers will be aware of the significance of this political change for the island of Ireland, particularly in relation to borders. If we ever do leave the EU there will certainly be consequences or at least difficulties in Ireland as a result. But for me, writing this novel, the referendum result had something of a silver lining because it gave me the opportunity to do something with this book that I couldn’t do with parts one and two: I could write my own ending. Having sounded out various people on this issue I came up with something that I felt was plausible and wove it into the novel and characterisation. The result is, I hope, food for thought, demonstrating the close relationship between fiction and real life. Thank you, Tracey. I’m glad that Brexit has had a positive effect on your writing! Tracey Iceton is an author and creative writing tutor from Teesside who completed a PhD in creative writing at Northumbria University. An English teacher experienced in delivering creating writing courses and workshops, Tracey won the 2013 HISSAC short story prize for ‘Butterfly Wings’, was runner up in the 2013 and 2014 Cinnamon Press short story competitions with ‘Slag’ and ‘As the world (re)turns’, which appear in the anthologies Journey Planner and Patria. She also won the 2011 Writers Block NE Home Tomorrow Short Story Competition and has been shortlisted for the 2012 Bristol Short Story Competition with ‘Apple Shot’ and the 2015 Mslexia Women’s Short Story Competition for ‘Ask Not’. Green Dawn at St Enda’s, her debut novel and part one of her Celtic Colours Trilogy, was published by Cinnamon Press in 2016 followed by Herself Alone in Orange Rain in 2017. White Leaves of Peace is the final part of the companion trilogy. Tracey regularly reads at literary events. Her stories have appeared in; Prole, Litro, Neon, Tears in the Fence, The Momaya Annual Review, The Yellow Room and Writer’s Muse. You can find her online on her website www.trywriting.co.uk.